What goes into selecting a healthy treat for your dog? Is it enough to select a treat based on the brand name or do you need to do a little more investigating into the ingredients of the treat……after all, isn’t a treat, a treat? Avoid soy, wheat, and corn; they are considered comman allergens. Avoid chemical preservatives, seek out natural preservatives. Look for healthy oils that provide a balance of Omega 3 & 6; like flaxseed, canola and fish oils. Protien on the ingredient list should be specific; chicken, beef, lamb, etc. – not “meat”, “animal”, or “poultry”. Select premium treats instead of economy treats. 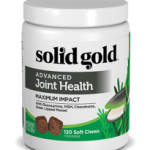 Select treats from Pet food companies known for their high quailty ingredients. Read the label and use your good judgement. Dogs, like humans, can eat too many treats and gain weight. If you like to give a lot of treats, try soft treats and break them up into small peices. You can then treat often, but is small amounts. Make sure the treats you are feeding your dog are not ‘insidious invaders’ which are playing havoc with your dogs health and sabotaging the healthy regime you have established by feeding healthy meals. 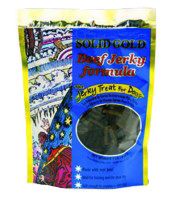 An excellent option for a healthy treat for your dog is Solid Gold’s Jerky Treats. They come in beef, lamb and turkey. These jerky treats are bite sized and are made with all natural ingredients, and are packaged in convenient, resealable 10 oz. pouches. 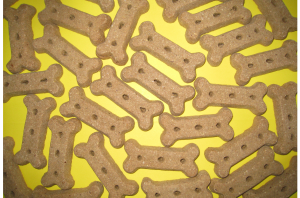 If your dog prefers biscuits, try our Cinna-Bone Dog Biscuits. 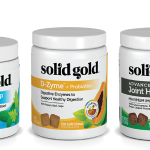 Being a Solid Gold product, they are made with all natural ingredients. They smell so good you may be tempted to try one yourself. Like a single ingredients treat? Our LA Treats (Lamb Appeal), are a superb choice. They are made of pure diced dehydrated lamb lung, and an extra bonus….if you have a cat the LA Treats are good for cats also. Please contact me if you have any questions about treats that complement your pet’s diet.